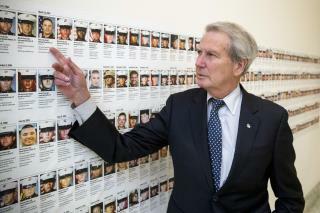 (Newser) – It's not the legacy Rep. Walter Jones would have wanted. But coverage of the longtime North Carolina congressman's death on Sunday is reminding the world that he helped make "freedom fries" a thing. Back in 2003, Jones received a letter from a constituent who owned a diner and had renamed his fries as a way to snub France—the French had just announced their opposition to the US-led invasion in Iraq, reports the Washington Post. Jones would say later that he didn't quite know what to do with the constituent's suggestion to rename America's fries, and he forwarded the letter to Rep. Robert Ney, who had oversight over the House cafeteria. Ney loved the idea and renamed the cafeteria's fries, and the move instantly gained international attention when the lawmakers held a joint press conference. Is that true? Did US legislators really believe Saddam Hussein had anything to do with 9/11? WTF? I thought they hit Iraq, because they bought the BS about weapons of mass destruction. These people get paid how much money to be that stupid? Too damned much. He helped kill a lot more than the 4000 US troops, if the US contractors, and local civilian deaths are counted. Al Qaeda in Iraq did not exist until the US invaded Iraq and then Al Qaeda morphed into ISIS. How can we thank you enough, monkey boy, for starting a war based on a bunch of lies?